One striking thing about the culture of fifteenth-century Ireland is what is not represented in it. There is not, to any great extent, evidence of that great flowering of European intellectual and artistic life that is summed up in the term Renaissance. The magnificent set of fifteenth-century Benediction copes and Mass vestments that survives from Christ Church cathedral in Waterford stands out as a rare example of Renaissance art in Ireland; but it could not be other than a European import. The vestments are first mentioned in 1481 in the will of John Collyn, dean of the cathedral. They are likely to have been commissioned by a wealthy local patron and must have cost a fortune: the fabric is Italian cloth-of-gold and the embroidery is Flemish, probably from the great workshops of Brussels, Bruges or Ghent. When Oliver Cromwell’s troops took the city in 1650 many of the city’s great religious treasures were destroyed. The vestments, however, were so well hidden that they were not discovered again until 1774, when the old cathedral was demolished. 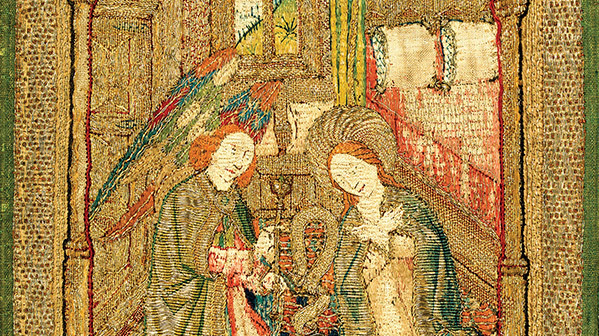 The most important part of the collection is the set of copes (liturgical mantles or cloaks): the red Creation Cope, illustrating the mystery of the Incarnation; the green Crucifixion Cope; a second green Marian Cope with marvellous velvet, and, featured here, the Magi Cope. It is staggeringly opulent: one-and-a-half metres high and two metres wide, brocaded velvet on cloth-of-gold, with a pile of red silk fixed with tiny loops of gold. The velvet almost certainly came from the Florence of Lorenzo Medici. The opulence is visual and metaphorical as well as physical. The hood of the Magi Cope alone depicts three parallel Biblical scenes: the homage of the Magi to the newborn Christ at the centre, the arrival of the Queen of Sheba at the court of King Solomon on the left and the visit of Abraham to Melchizedek on the right. The Flemish artists who designed the Magi scene almost certainly drew on depictions in a book that typified the spread of learning in the Renaissance period that was made possible by printing: the Biblia Pauperum, the ‘Bible of the Poor’ that was hugely popular in Germany and the Netherlands. Thus, the cope brings together some of the forces that were shaping western European culture: the burgeoning wealth of the Italian city states, the spread of books, the skills of a growing artisan class, a new visual imagery that implies a new way of seeing the world. Nothing like this could have been made in fifteenth-century Ireland. The Renaissance was above all an urban phenomenon, and in Ireland at the time urban settlement was, if anything, being reversed. Ireland was never cut off from the great cultural awakening, but experienced it largely as an import.